In music, harmony is the use of simultaneous pitches (tones, notes), or chords. The study of harmony involves chords and their construction and chord progressions and the principles of connection that govern them. Harmony is often said to refer to the "vertical" aspect of music, as distinguished from melodic line, or the "horizontal" aspect. Counterpoint, which refers to the interweaving of melodic lines, and polyphony, which refers to the relationship of separate independent voices, are thus sometimes distinguished from harmony. In popular and jazz harmony, chords are named by their root plus various terms and characters indicating their qualities. In many types of music, notably baroque, romantic, modern and jazz, chords are often augmented with "tensions". A tension is an additional chord member that creates a relatively dissonant interval in relation to the bass. Typically, in the classical common practice period a dissonant chord (chord with tension) "resolves" to a consonant chord. 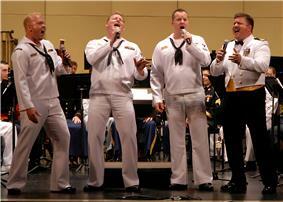 Harmonization usually sounds pleasant to the ear when there is a balance between the consonant and dissonant sounds. In simple words, that occurs when there is a balance between "tense" and "relaxed" moments. The term harmony derives from the Greek ἁρμονία (harmonía), meaning "joint, agreement, concord", from the verb ἁρμόζω (harmozo), "to fit together, to join". The term was often used for the whole field of music, while "music" referred to the arts in general. In Ancient Greece, the term defined the combination of contrasted elements: a higher and lower note. Nevertheless, it is unclear whether the simultaneous sounding of notes was part of ancient Greek musical practice; "harmonía" may have merely provided a system of classification of the relationships between different pitches. In the Middle Ages the term was used to describe two pitches sounding in combination, and in the Renaissance the concept was expanded to denote three pitches sounding together. Rameau's 'Traité de l'harmonie' (Treatise on Harmony) from 1722. 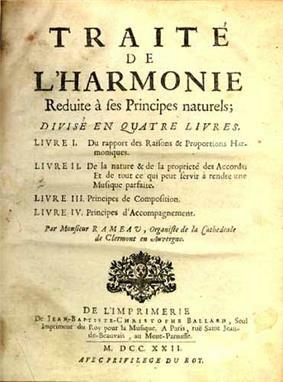 It was not until the publication of Rameau's 'Traité de l'harmonie' (Treatise on Harmony) in 1722 that any text discussing musical practice made use of the term in the title, though that work is not the earliest record of theoretical discussion of the topic. The underlying principle behind these texts is that harmony sanctions harmoniousness (sounds that 'please') by conforming to certain pre-established compositional principles. Descriptions and definitions of harmony and harmonic practice may show bias towards European (or Western) musical traditions. For example, South Asian art music (Hindustani and Carnatic music) is frequently cited as placing little emphasis on what is perceived in western practice as conventional 'harmony'; the underlying 'harmonic' foundation for most South Asian music is the drone, a held open fifth (or fourth) that does not alter in pitch throughout the course of a composition. Pitch simultaneity in particular is rarely a major consideration. Nevertheless many other considerations of pitch are relevant to the music, its theory and its structure, such as the complex system of Rāgas, which combines both melodic and modal considerations and codifications within it. So, intricate pitches combinations that sound simultaneously do occur in Indian classical music—but they are rarely studied as teleological harmonic or contrapuntal progressions—as with notated Western music. This contrasting emphasis (with regard to Indian music in particular) manifests itself in the different methods of performance adopted: in Indian Music improvisation takes a major role in the structural framework of a piece, whereas in Western Music improvisation has been uncommon since the end of the 19th century. Where it does occur in Western music (or has in the past), the improvisation either embellishes pre-notated music or draws from musical models previously established in notated compositions, and therefore use familiar harmonic schemes. Some traditions of Western music performance, composition, and theory have specific rules of harmony. These rules are often described as based on natural properties such as Pythagorean tuning's law whole number ratios ("harmoniousness" being inherent in the ratios either perceptually or in themselves) or harmonics and resonances ("harmoniousness" being inherent in the quality of sound), with the allowable pitches and harmonies gaining their beauty or simplicity from their closeness to those properties. This model provides that the minor seventh and ninth are not dissonant (i.e., are consonant). While Pythagorean ratios can provide a rough approximation of perceptual harmonicity, they cannot account for cultural factors. Early Western religious music often features parallel perfect intervals; these intervals would preserve the clarity of the original plainsong. These works were created and performed in cathedrals, and made use of the resonant modes of their respective cathedrals to create harmonies. As polyphony developed, however, the use of parallel intervals was slowly replaced by the English style of consonance that used thirds and sixths. The English style was considered to have a sweeter sound, and was better suited to polyphony in that it offered greater linear flexibility in part-writing. Early music also forbade usage of the tritone, as its dissonance was associated with the devil, and composers often went to considerable lengths, via musica ficta, to avoid using it. In the newer triadic harmonic system, however, the tritone became permissible, as the standardization of functional dissonance made its use in dominant chords desirable. Close position C major triad. Open position C major triad. Arnold Schoenberg, Béla Bartók, and Edgard Varèse's Density 21.5. Close harmony and open harmony use close position and open position chords, respectively. See: voicing (music) and close and open harmony. Other types of harmony are based upon the intervals of the chords used in that harmony. Most chords used in western music are based on "tertian" harmony, or chords built with the interval of thirds. In the chord C Major7, C-E is a major third; E-G is a minor third; and G to B is a major third. Other types of harmony consist of quartal harmony and quintal harmony. Unison is considered a harmonic interval, just like a fifth or a third. What's unique about unison is that it is two identical notes being played or sung together. Most people only consider thirds and fifths and sevenths to be "harmony". But, unison does count as harmony, and is very important in orchestration, especially. In Pop music, unison singing is usually called "doubling" which is what The Beatles used to do a lot in their early music. As a type of harmony, singing in unison or playing the same notes, often using different musical instruments, at the same time is commonly called monophonic harmonization. An interval is the relationship between two separate musical pitches. For example, in the melody Twinkle Twinkle Little Star, the first two notes (the first "twinkle") and the second two notes (the second "twinkle") are at the interval of one fifth. What this means is that if the first two notes were the pitch C, the second two notes would be the pitch "G"—four scale notes, or seven chromatic notes (a perfect fifth), above it. As can be seen, no note always corresponds to a certain degree of the scale. The tonic, or 1st-degree note, can be any of the 12 notes (pitch classes) of the chromatic scale. All the other notes fall into place. For example, when C is the tonic, the fourth degree or subdominant is F. When D is the tonic, the fourth degree is G. While the note names remain constant, they may refer to different scale degrees, implying different intervals with respect to the tonic. The great power of this fact is that any musical work can be played or sung in any key. It is the same piece of music, as long as the intervals are the same—thus transposing the melody into the corresponding key. When the intervals surpass the perfect Octave (12 semitones), these intervals are called compound intervals, which include particularly the 9th, 11th, and 13th Intervals—widely used in jazz and blues Music. The reason the two numbers don't "add" correctly is that one note is counted twice. Apart from this categorization, intervals can also be divided into consonant and dissonant. As explained in the following paragraphs, consonant intervals produce a sensation of relaxation and dissonant intervals a sensation of tension. In tonal music, the term consonant also means "brings resolution" (to some degree at least, whereas dissonance "requires resolution"). The consonant intervals are considered the perfect unison, octave, fifth, fourth and major and minor third and sixth, and their compound forms. An interval is referred to as "perfect" when the harmonic relationship is found in the natural overtone series (namely, the unison 1:1, octave 2:1, fifth 3:2, and fourth 4:3). The other basic intervals (second, third, sixth, and seventh) are called "imperfect" because the harmonic relationships are not found mathematically exact in the overtone series. In classical music the perfect fourth above the bass may be considered dissonant when its function is contrapuntal. Other intervals, the second and the seventh (and their compound forms) are considered Dissonant and require resolution (of the produced tension) and usually preparation (depending on the music style used). It should be noted that the effect of dissonance is perceived relatively within musical context: for example, a major seventh interval alone (i.e. C up to B) may be perceived as dissonant, but the same interval as part of a major seventh chord may sound relatively consonant. A tritone (the interval of the fourth step to the seventh step of the major scale, i.e. F to B) sounds very dissonant alone, but less so within the context of a dominant seventh chord (G7 or D♭7 in that example). In the Western tradition, in music after the seventeenth century, harmony is manipulated using chords, which are combinations of pitch classes. In tertian harmony, so named after the interval of a third, the members of chords are found and named by stacking intervals of the third, starting with the "root", then the "third" above the root, and the "fifth" above the root (which is a third above the third), etc. (Note that chord members are named after their interval above the root.) Dyads, the simplest chords, contain only two members (see power chords). A chord with three members is called a triad because it has three members, not because it is necessarily built in thirds (see Quartal and quintal harmony for chords built with other intervals). Depending on the size of the intervals being stacked, different qualities of chords are formed. In popular and jazz harmony, chords are named by their root plus various terms and characters indicating their qualities. To keep the nomenclature as simple as possible, some defaults are accepted (not tabulated here). For example, the chord members C, E, and G, form a C Major triad, called by default simply a C chord. In an A♭ chord (pronounced A-flat), the members are A♭, C, and E♭. In many types of music, notably baroque, romantic, modern and jazz, chords are often augmented with "tensions". A tension is an additional chord member that creates a relatively dissonant interval in relation to the bass. Following the tertian practice of building chords by stacking thirds, the simplest first tension is added to a triad by stacking on top of the existing root, third, and fifth, another third above the fifth, giving a new, potentially dissonant member the interval of a seventh away from the root and therefore called the "seventh" of the chord, and producing a four-note chord, called a "seventh chord". Continuing to stack thirds on top of a seventh chord produces extensions, and brings in the "extended tensions" or "upper tensions" (those more than an octave above the root when stacked in thirds), the ninths, elevenths, and thirteenths. This creates the chords named after them. (Note that except for dyads and triads, tertian chord types are named for the interval of the largest size and magnitude in use in the stack, not for the number of chord members : thus a ninth chord has five members, not nine.) Extensions beyond the thirteenth reproduce existing chord members and are (usually) left out of the nomenclature. Complex harmonies based on extended chords are found in abundance in jazz, late-romantic music, modern orchestral works, film music, etc. Typically, in the classical Common practice period a dissonant chord (chord with tension) resolves to a consonant chord. Harmonization usually sounds pleasant to the ear when there is a balance between the consonant and dissonant sounds. In simple words, that occurs when there is a balance between "tense" and "relaxed" moments. For this reason, usually tension is 'prepared' and then 'resolved'. One is lack of perceptual roughness. Roughness happens when partials (frequency components) lie within a critical bandwidth, which is a measure of the ear's ability to separate different frequencies. Critical bandwidth lies between 2 and 3 semitones at high frequencies and becomes larger at lower frequencies. The roughness of two simultaneous harmonic complex tones depends on the amplitudes of the harmonics and the interval between the tones. The roughest interval in the chromatic scale is the minor second and its inversion the major seventh. For typical spectral envelopes in the central range, the second roughest interval is the major second and minor seventh, followed by the tritone, the minor third (major sixth), the major third (minor sixth) and the perfect fourth (fifth). The harmonious major triad is composed of three tones. Their frequency ratio corresponds approximately 6:5:4. In real performances, however, the third is often larger than 5:4. The ratio 5:4 corresponds to an interval of 386 cents, but an equally tempered major third is 400 cents and a Pythagorean third with a ratio of 81:64 is 408 cents. Measurements of frequencies in good performances confirm that the size of the major third varies across this range and can even lie outside it without sounding out of tune. Thus, there is no simple connection between frequency ratios and harmonic function. Post-nineteenth century music has evolved in the way that tension may be less often prepared and less formally structured than in Baroque or Classical periods, thus producing new styles such as post-romantic harmony, impressionism, pantonality, Jazz and Blues, where dissonance may not be prepared in the way seen in 'common practice' harmony. In a jazz or blues song, the tonic chord may be a dominant seventh chord. The creation and destruction of harmonic and 'statistical' tensions is essential to the maintenance of compositional drama. Any composition (or improvisation) which remains consistent and 'regular' throughout is, for me, equivalent to watching a movie with only 'good guys' in it, or eating cottage cheese. ^ Malm, William P. (1996). Music Cultures of the Pacific, the Near East, and Asia, p.15. ISBN 0-13-182387-6. Third edition. "Homophonic texture...is more common in Western music, where tunes are often built on chords (harmonies) that move in progressions. Indeed this harmonic orientation is one of the major differences between Western and much non-Western music." ^ Dahlhaus, Car. "Harmony", Grove Music Online, ed. L. Macy (accessed 24 February 2007), grovemusic.com (subscription access). ^ a b Dahlhaus, Carl. "Harmony", Grove Music Online, ed. L. Macy (accessed 24 February 2007), grovemusic.com (subscription access). ^ Harmony, §3: Historical development. "Carl Dahlhaus", Grove Music Online, ed. L. Macy (accessed 16 November 2007), grovemusic.com (subscription access). ^ Harold S. Powers/Richard Widdess. "India, §III, 2: Theory and practice of classical music: Rāga", Grove Music Online, ed. L. Macy (accessed 16 November 2007), grovemusic.com (subscription access). ^ Harold S. Powers/Richard Widdess. "India, §III, 3(ii): Theory and practice of classical music: Melodic elaboration", Grove Music Online, ed. L. Macy (accessed 16 November 2007), grovemusic.com (subscription access). ^ Rob C. Wegman. "Improvisation, §II: Western art music", Grove Music Online, ed. L. Macy (accessed 16 November 2007), grovemusic.com (subscription access). ^ Robert D Levin. "Improvisation, §II, 4(i): The Classical period in Western art music: Instrumental music", Grove Music Online, ed. L. Macy (accessed 16 November 2007), grovemusic.com (subscription access). ^ Bruno Nettl. "Improvisation, §I, 2: Concepts and practices: Improvisation in musical cultures", Grove Music Online, ed. L. Macy (accessed 16 November 2007), grovemusic.com (subscription access).